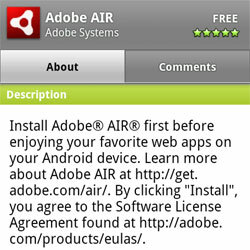 Adobe’s cross-platform AIR application system has shown up for download for Android devices, giving developers using the framework a fifth platform on which their code can run. The new release – which can be found in the Android Market – means that AIR apps that run on Mac, Windows, Linux and iOS systems will now also be functional on Android devices. Apps themselves will be distributed via the Android Market as usual, and as long as the user has the AIR runtime installed they’ll load just like regular apps do. An Android 2.2 Froyo device is required, and the apps themselves need to be formatted to suit a mobile device.